My daughter and I were rocking at the Ramblin’ Man Fair down in Maidstone today, when she spotted this oak bush cricket at one of the food stalls. This is a ‘proper’ oak bush cricket, with long wings. 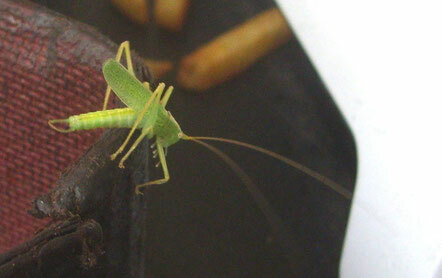 I didn’t realise for a long time, but every one I have seen for some years has been short-winged, which means it is either immature, or actually a southern oak bush cricket, a recent import from the continent, first recorded in the UK in 2001.